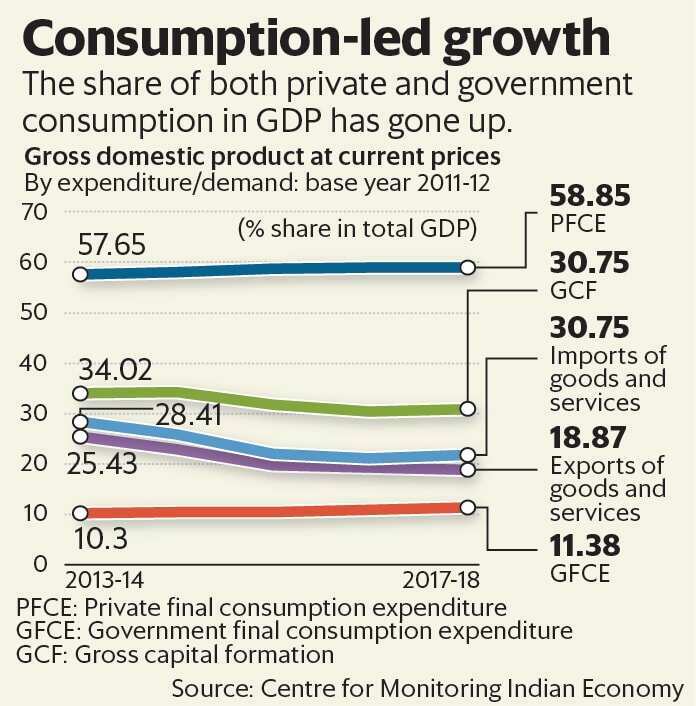 Consumption—both private and government—has been the main driver of growth since Narendra Modi came to power in 2014. If we were to put it in one line, the history of the Indian economy in the past four years has been the rise of consumption, both private and government, from 67.95% of gross domestic product (GDP) in 2013-14 to 70.23% by 2017-18. The details are given in the accompanying chart. While consumption has driven growth, the share of capital formation in GDP has fallen, from 34.02% of GDP in 2013-14 to 30.75% in 2017-18. Exports have done miserably—the share of exports of goods and services has plunged from 25.43% of GDP in 2013-14 to 18.87% in 2017-18, calling into question the competitiveness of Indian industry. The saving grace is the share of imports, too, has come down, thus keeping the current account deficit within reasonable limits. The Reserve Bank of India’s (RBI’s) annual report last year pointed out that for 2016-17, “absent the implementation of the 7th Central Pay Commission and one-rank-one-pension (OROP) for defence services embedded in government consumption, real GDP growth would have been lower by 2 percentage points. Private consumption spending alone contributed two-thirds of the growth of aggregate demand". The report added that consumption-led growth could lead to a slackening of future growth if it entails growing imbalances due to limits to capacity creation and rising debt burdens, particularly for households, and it talked of “the imperative for a judicious balance in the growth drivers for non-disruptive and sustainable long-term growth". Capital expenditure and exports badly need to catch up. Government consumption was boosted by the seventh pay commission award and the increase in pensions for the armed forces. What about private consumption? Households have been saving less, with the household savings rate falling from 20.3% of GDP in 2013-14 to 16.3% in 2016-17. The RBI report says the fall in inflation and the consequent rise in real incomes, together with the crowding-in effect of the rise in government salaries and pensions may have boosted private consumption. Rising private consumption has also been the result of increased borrowing by households. In March 2014, RBI data shows personal loans by banks amounted to 18.3% of total non-food credit; four years later, by March 2018, personal loans amounted to 24.8% of non-food credit. Indeed, in 2017-18, personal loans were almost half of the total increase in non-food credit advanced by banks. As a percentage of GDP, personal loans by banks went up from 9% of GDP in 2013-14 to 11.4% by 2017-18. To be sure, a part of this borrowing was used for housing. But a sizable part also financed consumption—for example in 2017-18, 29.3% of all incremental non-food credit went towards financing personal consumption. The RBI report warned, “Consumption as a driver of growth has been associated with low growth multipliers... with some evidence that side effects such as rising household indebtedness could turn out to be growth-retarding in the medium-term". Nevertheless, in spite of the rise in personal loans in recent years, credit to households as a percentage of GDP is much less than other emerging markets such as China, Indonesia, Thailand and far lower than in the developed nations. But there is no doubt that rising household borrowing and lower household savings have led to increased private consumption, which, together with government consumption, has been the main driver of the Indian economy in the past four years.